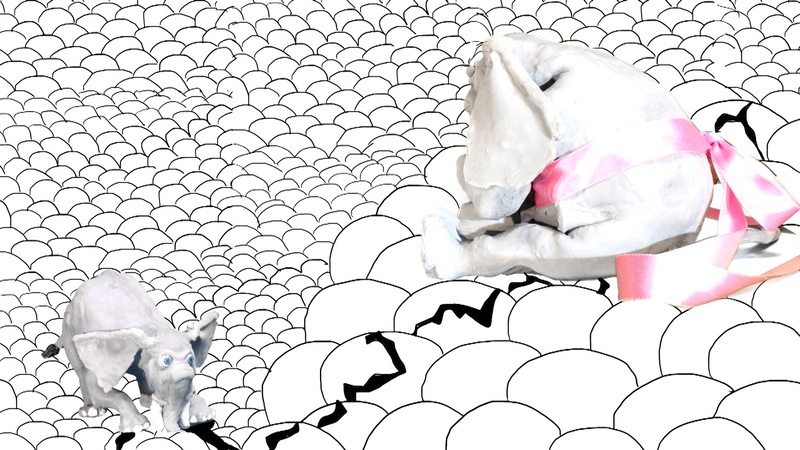 A clip from Alison B. Reed's elephant stop-motion story. Her project seemed to be relatively benign: A stop-motion movie about an elephant. As both the director and set designer, she hoped to construct a puppet protagonist out of foam latex via a process she found on YouTube. The materials she used were familiar, like household objects: latex, silicone, dish soap, vaseline, oil. The construction of the puppet, however, was a bit more involved. The first hiccup was the oven. “You needed an oven—an outdoor oven,” Reed says. “You were supposed to be doing part of this process outside.” Procuring this open-air oven like the tutorial suggested was a journey. After getting rejected by Harvard’s ceramics studio due to concerns about fumes, deliberating with the nearby Massachusetts College of Art and Design, and meeting with some graduate students in the chemistry department, she decided to abandon the foam latex for silicone. Switching media wasn’t the end of her concerns. “I ended up bringing it back to my dorm room and I would spray [silicone] outside of my dorm," Reed says. “By the end of winter break, my dorm smelled very much like this spray, which really scared me.” According to Reed, someone had a physical reaction to it after doing a thesis review in a room it was later stored in, and a professor in one of Reed’s later reviews characterized the smell as toxic. Safety is always a moving target. What's considered safe changes all the time. Reed’s elephant’s narrative came together by the end of the semester. A year out from its completion, Reed has had ample time to reflect about the role of safety in her creative process. The concept of safety shares an interesting relationship with the artmaking process, a discipline which often values the unconventional and groundbreaking. Navigating this balance has been a key consideration of students and faculty, with regards to both the larger art world and the more insular community at Harvard. As beautiful as the final products can be, working with various artistic media comes with a set of risks. And while the danger associated with performative pieces and heavy machinery might be obvious, other potential dangers are far less apparent. Paints, especially oil paints, are popular in artmaking. A staple of arts curricula around the country, many are risky for the same reasons they’re colorful: Neurotoxic heavy metals are often responsible for producing the different hues. Paintbrushes drying in the Carpenter Center. The health hazards of these metals are well documented with regards to industrial work. Though less information is known about their effects at the lower concentrations present in common paints, growing concern has caused manufacturers to begin placing relevant information on labels and shift towards synthetic—though potentially just as questionable—alternatives. “The big danger in oil painting class was actually the flammable materials which we use for our solvent,” Kennedy-Yoon says. One substance commonly cited in these conversations as a necessary evil is the well-identified carcinogen formaldehyde, used to mix with oil paints. While proper disposal of the solvent significantly reduces the risk of fire, other health hazards related to exposure are more difficult to contain. 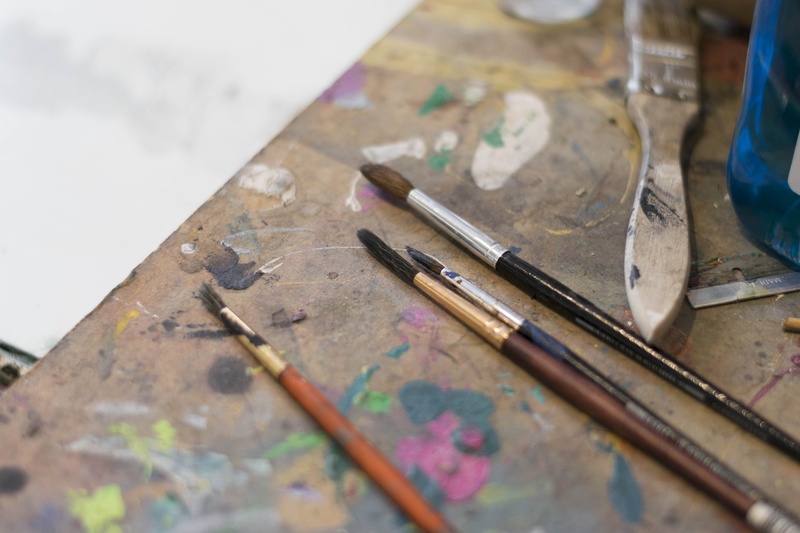 Artists in different disciplines face a whole different set of concerns. Resin, popular among modern sculptors, is a harsh irritant. It’s rumored to have contributed to the untimely death of Eva Hesse, an experimental artist prolific in the mid-20th century. A quick Google search pulls up dozens more risks that come with art. For example, toluene, a component of spray paint, is known to harm the central nervous system. And while the federal government responded to these findings by passing the Labeling of Hazardous Art Materials Act (LHAMA) in 1990, which mandates federal oversight, the exact chemicals going into art media today are ever-changing. It is no surprise, then, that Harvard’s own VES department keeps access to these chemicals on a tight leash. Students are encouraged to utilize University resources, but they must first enroll in a related class and work through training procedures. Thesis students trying to get ahold of their own materials must fill out a reimbursement form, and while the 2017 form does not explicitly mention safety, the request must be submitted to and cleared by department staff. Prohibiting certain materials, however, might restrict students’ abilities to effectively express themselves. Instead, the front lines of material safety at Harvard exist in the classroom, where risk awareness and mitigation are skills being integrated into the curriculum. “Perhaps a certain group of individuals in the art world more broadly has a kind of tendency towards disregard for one’s health and body. You know, you just have to go to New York to see all the art kids smoking,” VES concentrator Ariana L. Chaivaranon ’18 says. 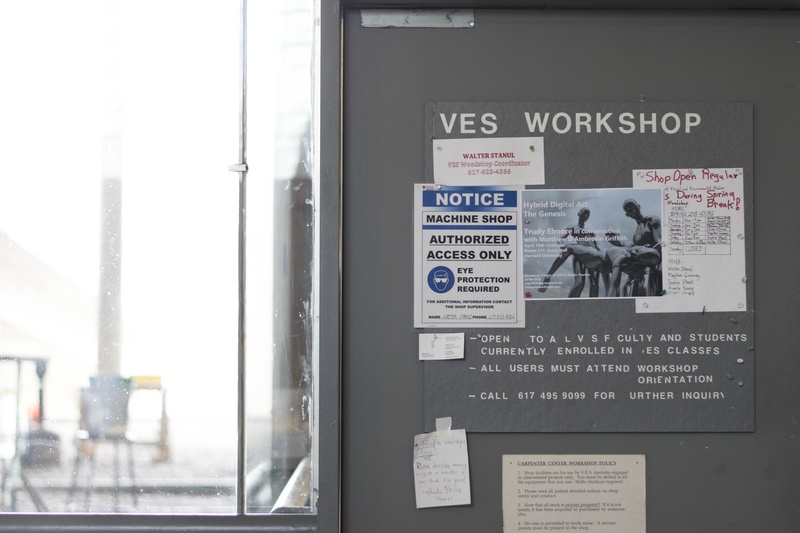 VES, Harvard’s resident art department, walks a fine line between providing students appropriate guidance to manage safety and ample space for independent work. “VES is the only concentration at Harvard where you make things with your hands,” Paula Soares, Manager of Academic Programs, says. As one supervisor of curricular art-making on campus, the VES department keeps a close eye on risk. At just around 80 concentrators, it is a moderately sized department with famously small classes. Within this sampling of students, there is a wide range of experience: Some enter college having already compiled award-winning portfolios, while others come into the department with hardly anything at all. “I don’t think I got anywhere beyond Crayola,” Reed jokes. VES, like many other departments, has a sophomore tutorial for building foundational skills. According to Matt Saunders ’97, the assistant professor who leads the class, the course provides students exposure to faculty members, canonical readings, and safety techniques. The result is the bedrock upon which future projects can flourish. 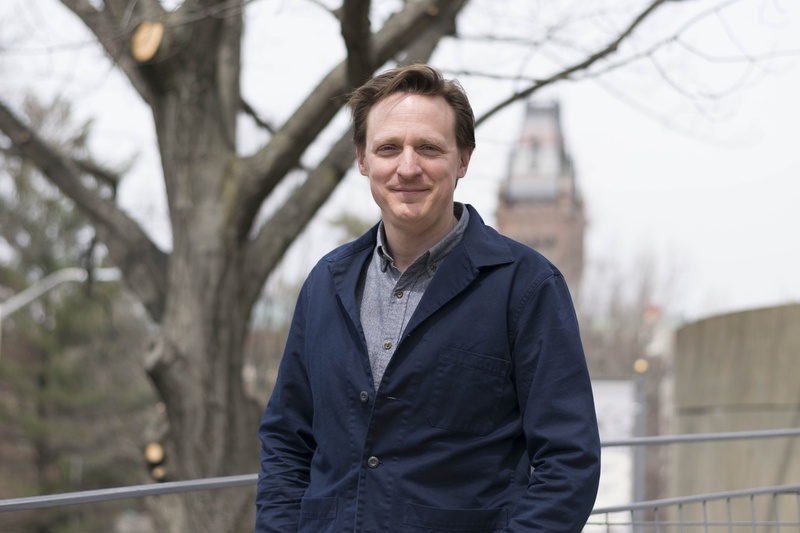 Matt Saunders ’97 is an assistant professor of Visual and Environmental Studies. And though the course is fairly new and a work in progress, the class has received a warm response from several students. “It’s a chance to get to the other people in the department, and we experiment with a lot of different media,” VES concentrator Memie H. Osuga ’20 says. Despite a focus on safety, the department still encourages academic and creative freedom. 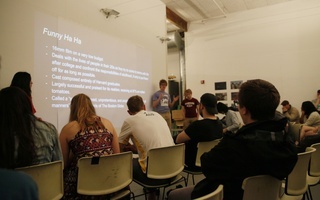 By the time they get to their senior year, many students opt to take on a senior thesis, an independent art project which is monitored by an advisor and three reviewers. The question of where to step in and where to step away has been an interesting question for the department. Some students take pride in challenging the norm and toying with the ensuing pushback. “I sort of went a little bit off the grid. I’m working on a project that no one else has done before in terms of medium or concept,” VES concentrator Essa Li ’19 says. Unlike her counterparts, Li has chosen to structure her thesis around exhibitions, running a space called the Vessel Gallery. Some are content with an increased amount of space more detached from constant oversight. “Honestly, I kind of like the VES method of ‘Go do stuff, and we’ll talk about it later,’” VES concentrator and thesis student Kevin Zhu ’18 says. “For every hour you spend in class, I spent an hour or two outside of class,” Kennedy-Yoon says. Art-making is a long, labor-intensive process, and classroom instruction is only the tip of the iceberg. The majority of the effort put towards creating a piece is developed independently. Thesis concentrators are afforded a space outside of the classroom in the form of Linden Studios. Perhaps fittingly, Linden’s history is a curious one suited to a creative center: Originally a set of squash courts, the building has since been re-outfitted into a studio space. 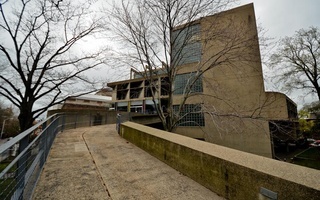 Today, the building boasts large rooms divided by partial walls and occupied by several students each. The tall, white walls are illuminated with ample lighting, and the shared air space blankets Linden beneath a quiet cover of conversation. Each room houses an assemblage of art supplies: Metalwork, canvases, and fabrics line the floor and walls. A flammable solution disposal container sits in the corner. 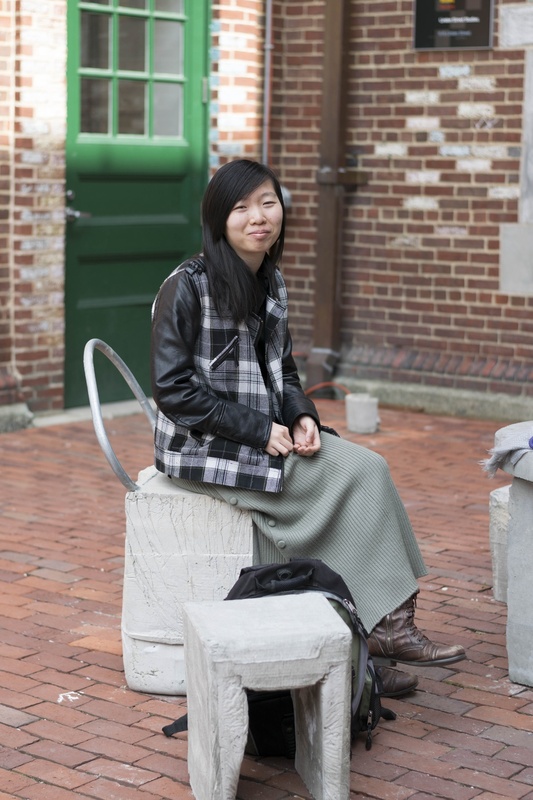 Susan Li ’18 sits outside of Linden Studios, where she does work for her VES concentration. To a first-time visitor, the atmosphere is strikingly casual. And maybe that’s part of the point. “If I were to look on Linden and maybe some of the practices in VES, I might be concerned because of the inherent safety risks involved,” VES concentrator Susan Li ’18 says. The issue of safety exists on a spectrum. 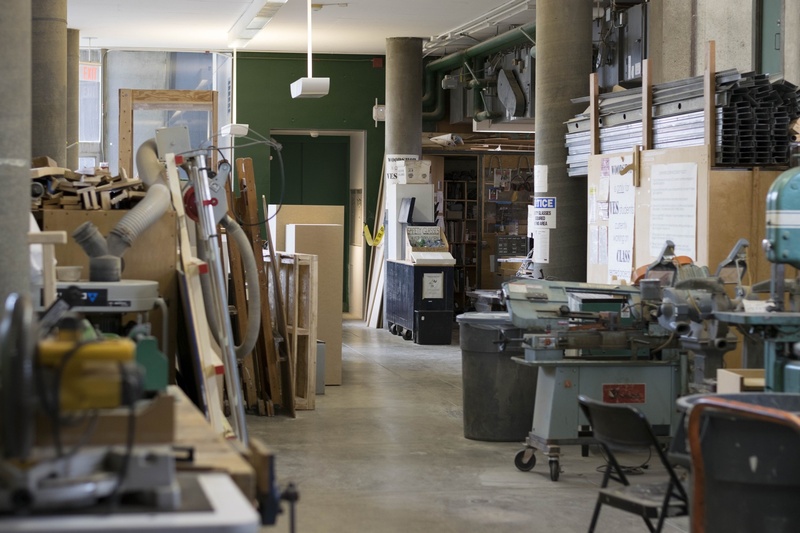 Behind the scenes of the Carpenter Center's wood shop. The protocols associated with various forms of media, however, are largely governed by the decisions of the professors who are most familiar with them. But even the development of a conscientious practice is not exempt from human error. Reed remembers moments when students working with resin were using inadequate gas masks to protect themselves. These lapses in judgment are not unheard of. 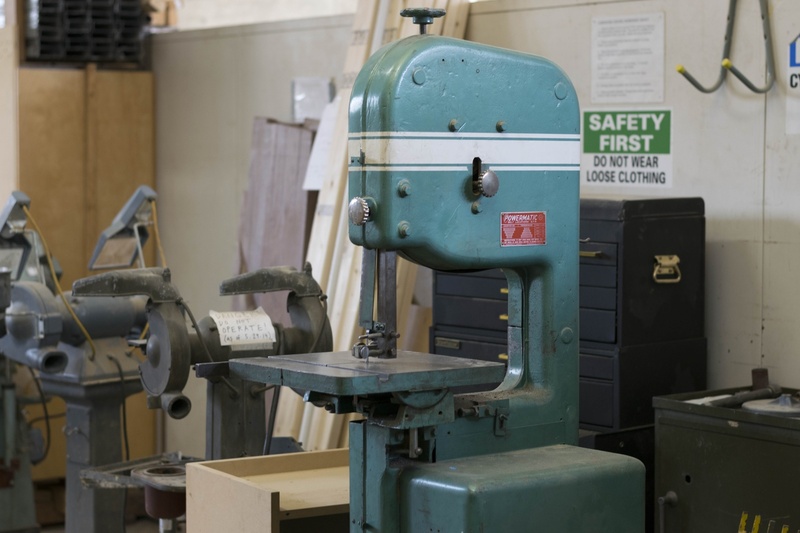 A band saw in the Carpenter Center’s wood shop. On the other side of the machine is a paper with safety rules. “If you’re working with things that have fumes, there is an open-air area that you’re supposed to go to. Not everyone does, and I find that very frustrating,” Kennedy-Yoon says. He recounts a story of when a student left open a bottle of acetone, causing the whole room to smell like the chemical and forcing an evacuation. “It’s the sort of thing you’d never do in front of the teacher,” Kennedy-Yoon says. In spite of potential dangers in the materials he has worked with, Kennedy-Yoon affirms his positive experience with the university as a nurturing space. “I am grateful that VES was a very positive and safe place for me in a college that did not always feel super welcoming or supportive,” he says. This sentiment is echoed by the department’s administrators. “Nothing’s worth getting hurt or sick. That doesn’t mean you can’t do great work. And there is work out there, once you get out to do whatever you want,” VES Chair Robb Moss says. Though influenced by the larger art world, Harvard’s VES department prides itself on providing a protected environment for burgeoning artists to learn. Physical safety is a well-established priority, but certain types of other risk are actually encouraged. Saunders draws a distinction between physical and creative risk, the latter of which is promoted in the classroom and in similar learning spaces. I don't want people taking physical risks in the class, but I want people taking conceptual risks or doing things that might fail. This enclave of arts at Harvard today exists as a space that both deliberately exposes students to and shelters students from risk in the world around them. A scene from Alison B. Reed's elephant stop-motion story. Members of the Faculty of Arts and Sciences will vote on a dual degree music program and on new legislation for the College’s program in General Education at Tuesday’s Faculty meeting. The undergraduate-only Department of Visual and Environmental Studies could formally house its own graduate program for the first time in 50 years, should the Faculty of Arts and Sciences approve a proposed merger between VES and the Standing Committee on the Ph.D. in Film and Visual Studies.